NESTLÉ® Cheerios Oat Crisp is a Delicious Combination of Crunchy Oat flakes and Crisp Oat Cheerios. NESTLÉ® Cheerios Oat Crisp is a delicious combination of crispy and toasted whole oat breakfast cereal flakes and whole grain wheat, corn, rice, and whole oat breakfast rings.  NESTLÉ® Cheerios Oat Crisp is the first RTE cereal in the market that contains Beta Glucan which helps reduce cholesterol plus easy to prepare in the morning. 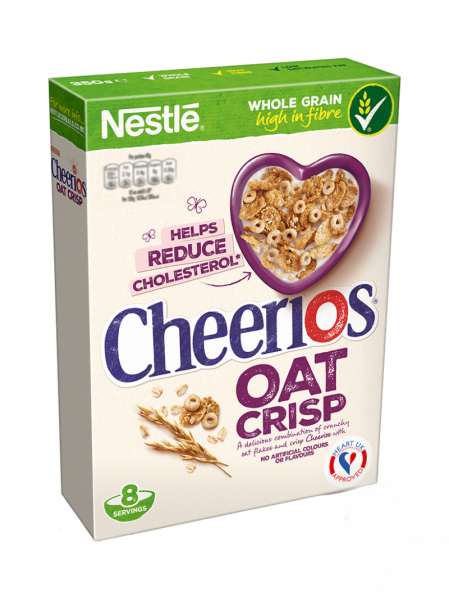  NESTLÉ® Cheerios Oat Crisp offers a convenient, affordable option to help consumers choose healthier lifestyle and potentially helps reduce cholesterol issues.